Finger Blood pressure checking Scanner Fun isaprank app. When you open Finger Blood pressure checking Scanner app, itwillask you to place a finger on phone screen, when you place afingerin finger shaped area then it will scan your finger and showyour BPon the scree. Fingerprint systolic blood pressure, diastolic heart rate andismore accurate blood pressure fingerprinting and heart ratemonitorapp for any smartphone and it does not need any externalhardware.use the digital fingerprint in blood pressure and heartrate sensorfor optimizing your exercise and to track your progressand highand low blood pressure. Install it now and keep fit. for a correct reading holdyourfinger on the fingerprint reader steadily and slightly to thewholemeasurement process. Do not move your finger on thefingerprintscanner until measurement is complete, breathenormally!fingerprint in blood pressure and heart rate is measuredbydetecting fingerprints on your finger that changes witheachheartbeat due to blood circulation. do not properly usetheapplication will result in a false reading. Disclaimer: Based on a novel approach, and huge ensembleaveragethis application is just meant to give you a simulated hintof BPmeasurements. Simulated values and original readings varyperson toperson based on their BMI and eating habits. Distancebetween thecamera and camera flash may add small error in thesimulatedresults. It is advisable to measure from real monitoringdevice asthis application just gives you simulated results whichcan be usedas a prank. This application requires little expertiseto operate.Please read all instructions carefully. Have a safelife. Fingerprint blood pressure and application heartbeat is nearyourfinger and analyzing the execution of your pace and give youhowmuch is calculated and give your mood related to yourheartbeat.fingerprint in blood pressure and heart rate scannerapplicationallows you to any time when you need to check your heartrate andblood pressure anywhere, anytime. without having tocalculate time,the number of beats and systolic, diastolic, madethe necessarycalculations. ● At the same time as in step No. 2 place your finger gently onthefinger mark and wait for more than 15 seconds. For moreaccurateresults hold it as much as possible by sitting stationaryon thechair. "blood pressure" is the force of blood pushing against thewallsof the arteries as the heart pumps blood. If this pressurerisesand stays high over time, it can damage the body inmanyways. It is advisable to keep a track of BP levels throughout theday. Note: This application is about fun and entertainment allresultsare wrong, please tell your friends and family thetruth. Finger Blood pressure checking Scanner Fun isaprank app.When you open Finger Blood pressure checking Scanner app, itwillask you to place a finger on phone screen, when you place afingerin finger shaped area then it will scan your finger and showyour BPon the scree.Fingerprint systolic blood pressure, diastolic heart rate andismore accurate blood pressure fingerprinting and heart ratemonitorapp for any smartphone and it does not need any externalhardware.use the digital fingerprint in blood pressure and heartrate sensorfor optimizing your exercise and to track your progressand highand low blood pressure.Install it now and keep fit. for a correct reading holdyourfinger on the fingerprint reader steadily and slightly to thewholemeasurement process. Do not move your finger on thefingerprintscanner until measurement is complete, breathenormally!fingerprint in blood pressure and heart rate is measuredbydetecting fingerprints on your finger that changes witheachheartbeat due to blood circulation. do not properly usetheapplication will result in a false reading.Disclaimer: Based on a novel approach, and huge ensembleaveragethis application is just meant to give you a simulated hintof BPmeasurements. Simulated values and original readings varyperson toperson based on their BMI and eating habits. Distancebetween thecamera and camera flash may add small error in thesimulatedresults. It is advisable to measure from real monitoringdevice asthis application just gives you simulated results whichcan be usedas a prank. This application requires little expertiseto operate.Please read all instructions carefully. Have a safelife.Fingerprint blood pressure and application heartbeat is nearyourfinger and analyzing the execution of your pace and give youhowmuch is calculated and give your mood related to yourheartbeat.fingerprint in blood pressure and heart rate scannerapplicationallows you to any time when you need to check your heartrate andblood pressure anywhere, anytime. without having tocalculate time,the number of beats and systolic, diastolic, madethe necessarycalculations.features:- Realistic looking Scanner- Simple to scan and easy to use- Totally free for Android users- Works with mobile phones and Android tablets- Clear and beautiful design UiUsage:● Step 1: Select gender● Step 2: Place your one finger on the complete camera touchingitsflash light at the same time● At the same time as in step No. 2 place your finger gently onthefinger mark and wait for more than 15 seconds. For moreaccurateresults hold it as much as possible by sitting stationaryon thechair. "blood pressure" is the force of blood pushing against thewallsof the arteries as the heart pumps blood. If this pressurerisesand stays high over time, it can damage the body inmanyways.It is advisable to keep a track of BP levels throughout theday.Thus we have developed simulator that simulates BP inaconvenient way to keep you reminding to calculate yourbloodpressureNote: This application is about fun and entertainment allresultsare wrong, please tell your friends and family thetruth. Butterfly is a nice colorful flyinginsect.Most of the people specially kids & girls love and wanttotouch and hold it. Here we have beautiful new stylishButterflyZipper Lock Screen Blue Butterfly Zipper Screen Lock is alockscreen application which locks the mobile screen with abeautifultheme of Pink Butterfly zipper locker. Whenever the mobilescreenis locked a beautiful picture of Pink Butterfly with zip willbeshown on the screen. **Zipper Lock Screen Features**- Battery Status- Missed Call Alerts- SMS Notifications- Date and Time- Easy and simple to unlock your phone- HD Graphics with beautiful wallpaper showing a colorful, cuteandsweet Butterfly- Easy to Enable / Disable the lock from settings menu.- Layout of Zipper lock is compatible with almost everySmartphonescreen displayhas very romantic and almost natural graphics of Butterflywithromantic purple and indigo color.Lovely Butterfly Zipper Lock application will show you averynatural scene in your very busy life.It's best application among all lock screen apps on Play StoreThis application does not require any authentication likepincode or password. To unlock the mobile you just need to unzipthescreen by simply dragging the zip down to the bottom of themobilescreen. Mobile will be unlocked as you drag the zip to thebottomof mobile screen.The beautiful design of this zipper lock screen app willalwaysgive you a real feeling whenever you unlock your mobilephone. Thisapplication is designed for all the fans of PinkButterfly who loveit to be on their mobile screen.Just drag the Butterfly Zipper Downward to the bottom thenLovelyButterfly Zipper Lock will unlock your smartphone. car key* Great prank tool car key application is no longer your phone \ onyour tablet. * Immediate download of fun to spend time. * This application gives the impression of a car owner. * Thanks to key applications can make jokes to your friends andhave fun ...* Apply with a lot of this can have hours of fun and the weathercan Horseback ...* Open the application of the car and the car passes through theair like your horse ...hyundai car carebuick remote startAnd here, an alarm simulator car key is now available on yourphone, enjoy and have fun as many times as you want because nobodywill say it is a joke, without breaking your head and alarm carkey.Make your phone a car key is now possible with the free app Car KeyAlarm Prank. Fool your friends as it is the key to your real carwith his new car key named Unlocker.The release key mentioned on your phone will make your car withoutparents believe that you can unlock your car with your mobile!For you lovers of farce, install the car key and alarm hand caralarm pleasure and both the car key Unlock, a free application foryou and your friends to have fun watching their reactions .Car key lock remote Universal will help you to remotely controlyour car its totally free app anduniversal remote for your car,we are giving you ten car keysimulator skins for you.you can select any of these and controlyour car,you can lock and unlock the car also able to control alarmand car horns .turn your smart phone as a smart key or remote foryour car.we are listed almost top 100 car brands in our app.if youare using any of the car brand download our app and give atry.NEW! Car Key Alarm PRANK has a ring as the true sound of the caralarm, and you can use for your custom ring tone to your phone. Theapplication is free and fun at the same time, also the key to hiscar is automatically set directly on your mobile after installingthe application by pressing the button mentioned allringtones.CHARACTERISTICS- For car alarm with a release button that turns well on the volumeof your phone until its maximum value to live a better joke.- You can enjoy the maximum possible from this experience, you canenable, disable at any time until a new farce.- The alarm car with high quality car alarm buttons that seem true,the image is improved and optimized is designed for smart mobilephones. This is the best application with a quality / pleasure youcan find on Android.- The application of sound are of high quality, they were made andadjusted to optimize efficiency with the maximum volume of yourphone.- For better enjoyment, keep your finger on the car alarm key to beable to have constantly ringing.- Key Car Alarm Prank simulator, a car key with impressivevibration effects. It's very easy to enable or disable with the keyswitch.- An impressive application, you will find in it what you will notfind on other applicationsCar alarm key - this application is a joke game with the help ofwhich you can open the doors of cars or alarm bells for the purposeof jokes or drawing. Making fun of their parents or friends, ifthey worked or signaling have opened the door of their car. Laser pointer Flashlight Game is nowanapplication available on your Android devices, free andfunapplication, a simple laser pointer simulator to use.Then use our secure laser pointer! With this laser simulatoryoucan play and be sure not to anyone notTo take advantage of its features, the laser pointer gives youasimple trick is to press the button of the laser pointermentionedon your screen, press the screen with a straightclick,the Free laser pointer flashlight game, is a gameofentertainment, it is designed for researchers noveltiesandtechnological innovations to make the most of the effects oflaserwith different colors and specific, unique sound effectsandvibration programmed laser on the system precisely to enable youtotake advantage of a wonderful joke to you, your familiesandfriends.There are four different laser pointers, the first pointerisunlocked from the start and can make use of it from thefirstmoment. Battery Solar Charger PrankAwesome prank App to charge up your mobile device in quick way!Youcan show your friends that how you charge your mobile deviceusingbuiltin on screen solar panel in your smartphone. Solarprankbattery Charger uses the phone's light sensor to chargebattery.Just a few minutes in the light and you will see yourbattery levelincreasing.The simple and the best way to prank your friends is chargeryourmobile battery using this solar battery charger. Inthisapplication has special feature of showing the batterycharginganimation only during the sun light duration say frommorning 6till evening six. This animation of battery charging willbe verymuch like the original charging of mobile battery. Prankwith yourfriends with this perfectBetter than other solar charging apps in the market.Simply start the app put it in the sun and watches as itregeneratesyour smart phones battery. If you cover the solar panelwith yourhand in the evening, then the charging will not start.Tell yourfriends about this application and prank them. This isSolar batterycharger technique. This applicationconsumes energy from your battery.charging by Sun light.Better than other solar charging apps in the market.Simply start the application put it in the sun and watches asitregenerates your smart phones battery.If you cover the solar panel with your hand in the evening, thenthecharging will not start.Tell your friends about this Solar battery chargertechniqueapplication and simulate them.This applicationFeatures:- Solar charger- Realistic Solar Panel Like Graphics- Faster : Charge your phone faster with this Solar ChargerforAndroid Mobile- Give you a alert when phone is fully charged.- Beautiful charging interface. This Christmas play 1000 levels of thebestbubble shooter game on the market.Christmas Bubble Shooter is a fun and addictive bubble shootermatch3 game with 2 game modes, over a 1000 levels of puzzle modeandanother 100 arcade levels.This game is extremely addictive, probably the most played ofthebubble shooting games.Bubble Shooter: Christmas Day will give you the mostpowerful,festive and fun christmas you've ever experienced.Christmas Bubble Shooter is an amazingly beautiful game thatwillimmerse you in the Christmas feeling and provide you withendlesshours of challenging and addictive fun.We are sure you will love this game, and ask you to rate usandspread the Christmas atmosphere by sharing it with allyourfriends.Bubble shooter free download game - another classicbubblematch-three game come to Google Play. Pop, tap and tilt yourwaythrough over 40 addictive bubble popping puzzles withexcitementand packed with adventure in this classic bubbles shooternew game- Bubble Shooters Games Free Bubble Shooter FreeDownloadHow to play: Touch the screen where you want the bubble togo,combine 3 or more of the same color bubbles to burst them,beforethey reach the bottom of the screen.More than 64 magic levels to complete! And more levels arecomingsoon.- Easy and fun to play, challenging to master- Leaderboards to watch your friends and competitors in thisgreatBubbles Shooter new game!- 4 Special Boosters help you get high score.- Cute dragon pups boost your points.Enjoy Bubble Shooters Games Free - Bubbles Shooter NewinChristmas style!How to Play:1.Tap where you want to shoot bubble2.To group 3 or more bubbles to make them burst3.Clear all the bubbles on the screen to level up,and try to get3stars on each level.Tips: Breaking the bubbles continuously can get points asbonus! Finger Scanner Simulator is a prank app thatsimulates the finger scanning. It is just for fun. You can use itto play game. Finger Blood Pressure Scanner is built onlyfor fun.Fingerprint blood pressure and Heartbeat detector is a free smartphone android application.Fingerprint blood pressure systolic, diastolic and Heartbeat rateis the most accurate fingerprint blood pressure and Heartbeat ratemonitor app for any Smartphone and itdoes not need any external hardware. Use fingerprint bloodpressure and heartbeat rate detector for optimizing your exerciseand to track your progress and high and low bloodpressure.When you open Finger Blood Pressure Checking Scanner app, itwill ask you to place a finger on phone screen, when you place afinger in finger shaped area then it will scanyour finger and show your BP on the scree.Features:- Realistic looking scanner- Simple to scan and easy to use- Totally free for Android users- Works with Android mobiles and tablets- Clear UI and beautiful designFinger Blood Pressure Scanner app will not show any accuratevalues when you scan your finger for BP.Disclaimer> Blood Pressure Scanner Prank is only for fun and entertainmentpurposes and a prank application> And no real "Blood Pressure" will Disply from your device. Normal resting blood pressure in an adult is approximately 120/80mm Hg. Blood pressure varies depending on situation, activity, anddisease states. Blood pressure is usually expressed in terms of thesystolic (maximum) pressure over diastolic (minimum) pressure andis measured in millimeters of mercury (mm Hg). 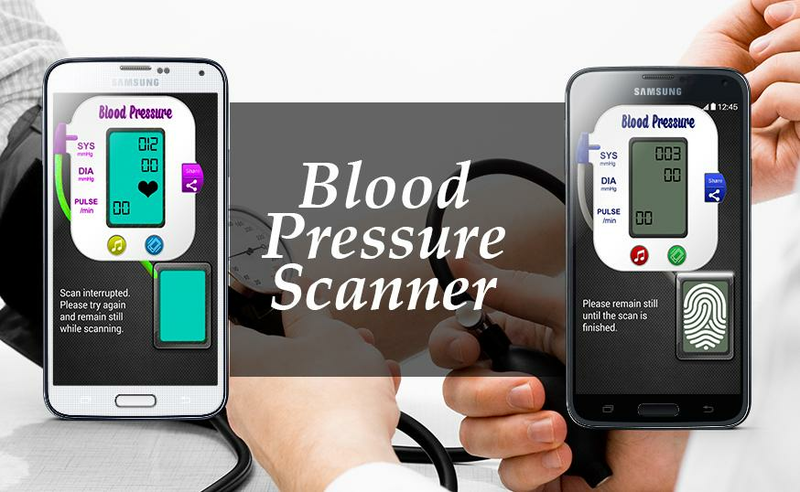 Blood pressurechecker prank is new and completely free that is designed tocalculate and check blood pressure with fingerprint impression.This app is designed just for fun and entertainment. Pranksterswould love completely when they download and install fingerprintblood pressure as they have a real prank app to show of power ofandroid device. This app is its initial state and tested on everyandroid device such as mobiles and tablets. Finger blood pressureworks with almost every android version.Features:=======1. HDgraphical user interface.2. Smooth animation of scanner with bar.3.Show heart beat animation.4. Show blood pressure in digitalformat.5. Looks like a real fingerprint scanner with smoothvibration.6. Show systolic blood pressure.7. Show diastolic bloodpressure.8. Show heart beat or pulse value to make this app morereal.9. Completely free and do not require internet connection. 10.App for fun and entertainment purpose only.How to Use:=========*_Fingerprint blood pressure checker works quite easily andefficiently. Just run application and select gender. Place fingeror thumb on scanner and wait for scanning. Do not lift your fingeruntil scanning is complete. After some calculation blood pressurechecker will show you blood pressure on a monitor in a digitalformat.Note: Blood pressure checker prank is design just forentertainment and fun purpose only. It is not possible to calculateblood pressure with fingerprint impression or finger scanning.Values used in this app are fake and randomly generated. 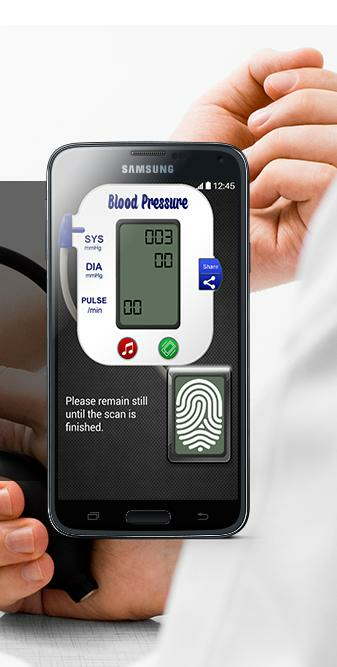 Pleasegive your precious feedback to make finger blood pressure more realfor every android user...!! Thanks..!! Features:- Realistic looking scanner- Simple to scan and easy touse- Totally free for Android users- Works with Android mobiles andtablets- Clear UI and beautiful designBlood Pressure Scanner is afree smart phone android application for calculating blood pressureand heart beat rate.Step 1: Select your gender.Step 2: Now placeyour finger gently on the fingerprint scanning pad and wait for theanalysis.Result: Your Fake blood pressure will be shownautomatically.Disclaimer:Finger Blood Pressure BP Prank is forentertainment purposes only. It does not calculates you bloodpressure. Calculating Blood Pressure is not possible with yourandroid device's screen and camera. The displayed results arerandom numbers. It is the best application for fooling yourfriends. It's An awesome prank! Fingerprint BloodPressure will provide you the most easiest way of checking out yourblood pressure. Fingerprint Blood Pressure will calculates yourblood pressure..This app is just prank scanner to calculate your bloodpressure.HOW TO USE:Step 1: Select your gender and tap on next.Step 2: Now place your finger gently on the fingerprint scanningpad and wait for the analysis.Result: Your Fake blood pressure will be shown automatically aftercalculation.Step 3: You can share the result with friends also.FEATURES✔ A prank application to collect cheers moment with yourfriends✔ HD graphics and beautiful use of scanner animation✔ Too much user friendly and easy to use✔ FREE fun for all✔ Finger Blood Pressure Prank 2 does not require internetconnection.✔ Finger Blood Pressure Prank 2 FREE fun for all.✔ Finger Blood Pressure Prank 2 is completely free download.Note : finger print blood pressure calculator is a prank and fakeapplication and it is not capable to measure the blood pressure ofa human body, all the reading that are used in this app are fakeand randomly generated by app. It is developed for the sake ofentertainment and joy. Fingerprint blood pressure and Heartbeatdetector is a free smart phone android application.blood pressure fingerprint scannerFingerprint blood pressure systolic,blood pressure fingerscanner,hypertension, diastolic and Heartbeat rate is the mostaccurate fingerprint blood pressure and Heartbeat rate monitor appfor any Smartphone and it does not need any external hardware. Usefingerprint blood pressure and heartbeat rate detector foroptimizing your exercise and to track your progress and high andlow blood pressure. "blood pressure diary" has been developed for those who need steadyblood pressure control and provides a blood pressure recordingservice.You can check your blood pressure history in daily, weekly,monthly, and yearly graphs as well as the complete datarange. Blood pressure checker app is an awesome prankapp! Blood Pressure checker prank will give an impression that thisapp check your blood pressure.Actually it is prank app for entertainment purpose. Blood pressurechecker app give alot of laughter between your friends.Fingerprint Blood Pressure checker prank will give an impressionthat this app calculates your blood pressure like a real bloodpressure machine.An amazing prank application "Blood pressure checkerPrank".If you are a prankster you would definitely love thisapplication.Blood Pressure checker is actually a prank application whichcalculates your blood pressure and is made for the people who justwant toplay pranks on others and want to show off the power of theirlatest android device.It is designed in such a way that no one that will aware that it isa prank blood pressure machine.Features:- People would think as it is a real Blood Pressure Calculatingapplication.- Blood Pressure Test Prank is a fun app which will generate randomBlood Pressure (BP) Values.- It's an amazing prank application "Blood Pressure CheckerPrank".- Blood Pressure checker Prank is only a prank app which willnot display accurate BP readings.- BP Scanner app is very easy to use. All you need to do is justopen- Blood Pressure Test Prank app and place your finger on thedesignated position on your mobile screen and it will scan anddisplay random Blood Pressure values.- A prank application to collect cheers moment with yourfriends- HD graphics and beautiful use of scanner animation- Too much user friendly and easy to use- FREE fun for allDisclaimer : Finger print blood pressure calculator is a prankand fake application.It is only for entertainment. It is not foruse in the medical field or medical purposes.